City Commission approves easement for Love’s Corp.
Valley City (CSi) The Valley City Commission met Tuesday evening at City Hall. All members were present. The Arbor Day Proclamation was read by Mayor Carlsrud. Arbor Day May 3, 2019. Blocking off the Street for Valley City Fire Department on Central Avenue from 4th Street to 5th Street N on May 1, 2019, for a mock traffic crash. Approved an Electrician and/or Plumber License for Hope Electric; Wrigley Mechanical, Inc.
PUBLIC COMMENTS …No one spoke. The bid package for all five was rejected and rebid until fall, when it’s expected that the bids will be lower. The City commission approved transferring Access easement from the NDDOT (Love’s development) to create a right of way easement for the city that will support the extension of a south side frontage road along the interstate. City Administrator Schelkoph said the action will create a new city street, accessible to all motorists and Swanberg Construction. 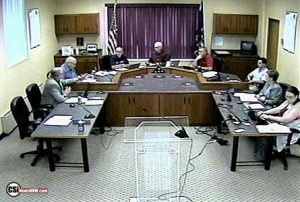 The Valley City Commission had previously approved annexing a tract of land located southeast of I-94 exit 292 in Valley City. The Loves Corporation was founded in 1964 and is based in Oklahoma City, Oklahoma and plans to open a new travel center and truck stop in Valley City. Approved was a bid for Electrical Department bucket truck from Terex in the amount of $221,650.00 City Administrator Schelkoph said they city typically uses that type of truck for about 20 years. The present truck is 15 years old, and will be bid for sale. Approved was a Permanent Flood Protection Phase IV buyout purchase at 310 2nd Ave SW for $185,000 City Administrator Schelkoph said the purchase was previously approved in the fund in conjunction with the State Water Commission. He said Phase IV buyouts bids are expected this year. Approved was a Permanent Flood Protection Phase IV buyout purchase at 206 4th St SW for $68,000. Approved was a Permanent Flood Protection Phase IV buyout purchase at 537 4th St SW for $114,000 City Administrator Schelkoph said the structure inhibits the city mitigating floods. Approved was an Application for Property Tax Exemption for Improvement to Residential Building at 958 2nd St NW City Assessor Hansen said after demolition, new construction will start on the site, and the owners have applied for the exemption. Considered was a request from South Central Adult Services for $20,000 to support the transit program Director, Pat Hansen resubmitted the request. 60,000 rides are given each year. The City Commission, Tuesday, tabled the request, pending additional information, to come before the Finance Committee, and City Commission at a later date. Approved was a Special Alcohol Beverage Event Permit for American Legion at VCSU Student Union on April 23, 2019 for Development Corporation & Chamber of Commerce Annual Banquet. David Schelkoph said water inflows to Lake Ashtabula are reduced as of Tuesday, adding the Corps of Engineers plans to reduce the release at Baldhill Dam on Wednesday. Before the City Commission meeting on Tuesday evening, Schelkoph said, the city has decided on a more beneficial project schedule for Streetscape I. He said the city has received one more option as to the construction schedule for the Streetscape project. This proposal would cut in half the work on Central avenue South to North between Main St. and 4th St. and only close half of Central Ave. (no more than two blocks) at a time. This will mean that the street in front of all business on Central Ave. will be closed only for 5-6 weeks at a time if all goes well. This is a significant reduction to the 8-10 weeks previously scheduled. By choosing this plan the work on the Streetscape I project can start in early May with a work stoppage to accommodate Rally in the Valley. There will be more information coming from the city with the final work schedule in the next few days. A preconstruction Public Meeting will be held next Tuesday, April 23, and all business on Central Ave. will be invited to hear the details of the construction schedule and scope of work on Central Ave. A Public information meeting will be next Thursday, April 25. Mayor Carlsrud said the recycling program in Valley City is continuing as usual at this time. He commended the city street crews on the recent snow removal adding that the alley are currently getting attention. Citywide Cleanup week in Valley City is May 6-10, 2019. City Fire Chief Scott Magnuson cautions residents to stay off local bodies of water, while the water levels remain high.